My challenge for 2016 was to run four marathons in one year, to highlight that 1 in 4 people in the UK will experience a mental health problem each year. I’m proud to say I completed this goal! 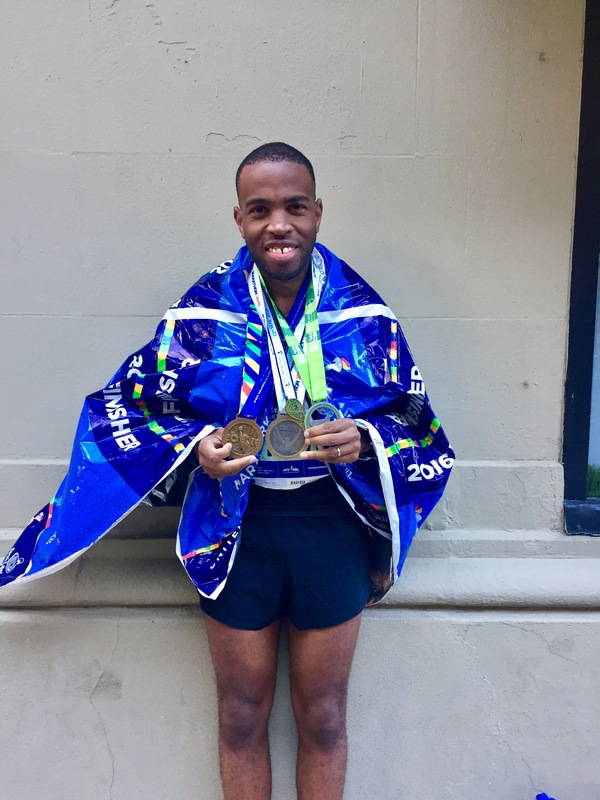 I’ve completed the Manchester, Richmond Park and Robin Hood, New York marathons. Firstly…I would like to thank everybody that has supported me on this journey, your kind messages have really inspired me and pushed me forward in all four races. I’m not a fast marathon runner, back in 2010 I ran 3 marathons all over 4 hours. And it was my goal to show that even someone like me can improve on their times. Thankfully I’ve been able to get 4 sub 4 hour marathons for this challenge. I’m thankful for the gradual improvement and aim to get my PB down next year. From completing this challenge I hope that I’ve demonstrated that for all of those people who count themselves as one in four, don’t let what you think you can’t do stop you from doing what you can do. 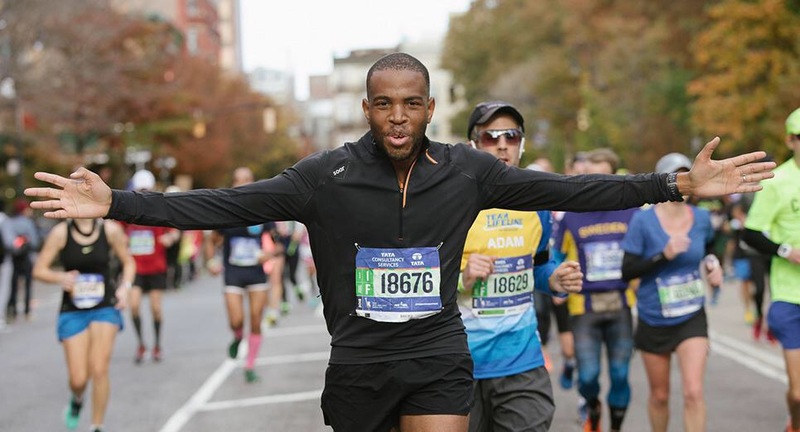 This is a summary of my most recent run, the New York marathon. I left my Airbnb apartment about 5:30am on the way to the coaches, which take you to the start line, based at the library near Bryant Park. When they say that New York is the city that never sleeps, it’s definitely evident as I walked through Time Square. By joining this global running community I got to talk to Patrick from Instagram @irun26point2__ on the coach on the way to the race line. He is a fast runner and a really down to earth guy. I’m always keen to learn from better runners and he gave me some solid advice, in talking about improving race pace, fuel for running etc. At the start I was greeted to Frank Sinatra’s “New York, New York” before I started on the Verrazano Bridge. To the left I could see the NYC skyline, which was picturesque with the blue sky and sun shining. To the left of me I saw the NYFD Fire Boat with water cannons blasting the water in a salute to the start. It’s an amazing start, and it’s really easy to forget that the Verrazano Bridge is a long hill, so I was “trying” to hold my pace but not get taken in by the moment! The congestion from Staten Island starts to open up and I could start getting into my stride. The first part of the race you try and keep it conservative…but this part of the course is relatively flat and the atmosphere in Brooklyn is live! The people and the entertainment are amazing. Coupled with the fact, I got spotted and cheered by Charlie Dark founder of Run Dem Crew. Then I got to high five and get cheered by the running legend that is Bart Yasso. These events added to the adrenaline and made me push abit harder early on. 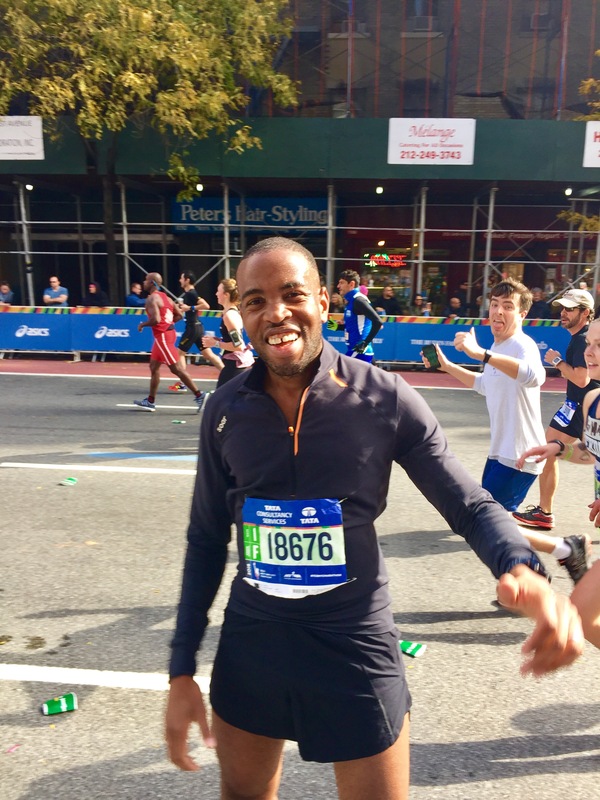 The lesson learnt was, there is saying you’ll keep your head, and actually keeping your head to run at a sensible pace… but I challenge you to run New York and not get taken in. My training has been beset by an Achilles injury which prevented me running consistently for approx 5 weeks before the marathon. So mentally it was hard to prepare a race strategy, as I wasn’t confident of how far I’d get before, I’d start slowing down. This happened for me in Queens. Once the party that is Brooklyn has ended, I approached the 59th Street Bridge. It was hilly and bar the sound of plodding feet, it was strangely silent. It’s a place where doubts were starting to creep in. Once you come off the bridge and take a left, the noise from the crowd is electric. It’s like walking into a surprise birthday party. I knew after the bridge I’d see my wife, and was so ecstatic to see her (as you can tell in the photo..and no i didn’t hold that smile through the race). Great photobomb by a fellow runner. This course is deceptively hilly and my legs were really feeling it here. The crowds on First Avenue were making this event so special and kept me going. The bands throughout the course were amazing, from listening to the Superman theme, the Rocky theme, to Journeys – Don’t Stop Believing, to the live Hip Hop MCs and backing dancers doing the splits… To the big bands/choirs. Etc. Etc. The entertainment is epic, to the point you actually want to stop and listen but remember… your running marathon (focus). So as I approached the final five of the bridges (Madison Avenue Bridge) I remember a women enthusiastically cheering the runners on, saying welcome to the Bronx. And she was right it was like going to another party. The noise and the people were incredible! So heading back to Manhattan, at times I had to remind myself not to look too far ahead, because the streets coupled with the runners just disappear into the horizon, down the long road straights. In moments like these it was crucial to focus on the moment, and focus on where I was placing my feet and not get overwhelmed by what lay ahead of me. Then I got to Central Park. If you’ve ever watched the Tour de France on the TV, where you see the crowds are so close to the riders, this is how this felt. The course felt like it narrowed and you could really feel the energy from the crowd. I thought the crowds were enthusiastic beforehand, but the noise level kept going up and up. Prior to the race I knew I wasn’t fit enough to challenge my PB. This makes it hard to work out your race strategy, but my goal was always to do a sub four time for all four 2016 marathons. 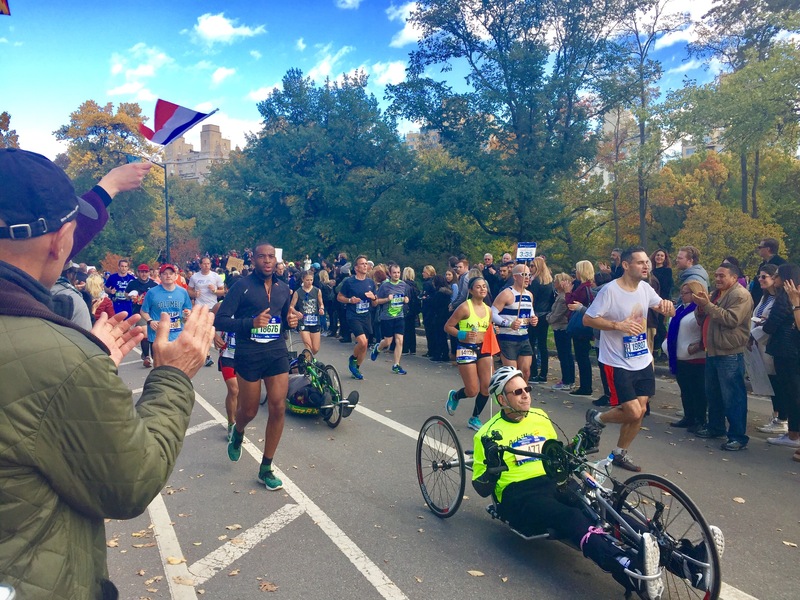 The conversations got really dark towards the end of the race as doubts entered my mind, but I reminded myself why I was there and it drove me forward. And to achieve my target is an amazing feeling. The pure emotion I felt and the adrenaline boost from the crowd, ordinarily would be a bad mix, but it really helped get me to the finish. Then I saw my wife around mile 25, which added to the emotion, and tears were shed on the run to the finish. In my head I felt like a Gazelle bounding effortlessly to the finish, but the reality was a slow but consistent run/shuffle. After receiving my medal, it felt as if someone turned off the power to my legs as they shut down. My arms were moving but my legs weren’t. I was totally spent. I had the bag option and the first part of the long walk to the exit was not pleasant. This is one price of the marathon, but the sense of achievement far outweighs the moments of pain. But on the way to the exit, I saw a guy called Sam, who is a 6 time World Marathon Major finisher. The first thing I said after patting him on the back, was congratulations on your amazing achievement, and we got chatting. It was great to hear his experiences of completing this epic challenge which is my goal. In talking to him, it actually gave me a second wind and took my mind of how much everything hurt. I’m thankful for the time I spoke to Sam, as it refocused me on my next goal to complete all the six world majors. Great job and amazing accomplishment! Fantastic accomplishment and a great way to suppory the mental health issues currently affecting Londoners and the country in as a whole. Really good time line/ photgraphs as well. Well done on 4 in 4, hope Tokyo goes well for you! NYC is such an amazing race to run.